The Food Insecurity Nutrition Incentives (FINI) Program provides grants on a competitive basis to projects that help low-income consumers participating in the Supplemental Nutrition Assistance Program (SNAP) purchase more fresh fruits and vegetables through cash incentives that increase their purchasing power at locations like farmers markets. Increasing low-income communities’ abilities to purchase fresh fruits and vegetables not only helps to improve the health of families, but also expands economic opportunities for farmers. The Program was first established in the 2014 Farm Bill with $100 million in funding. In the 2018 Farm Bill the program was expanded to $250 million and named after former FMC board member and tireless advocate, Gus Schumacher. 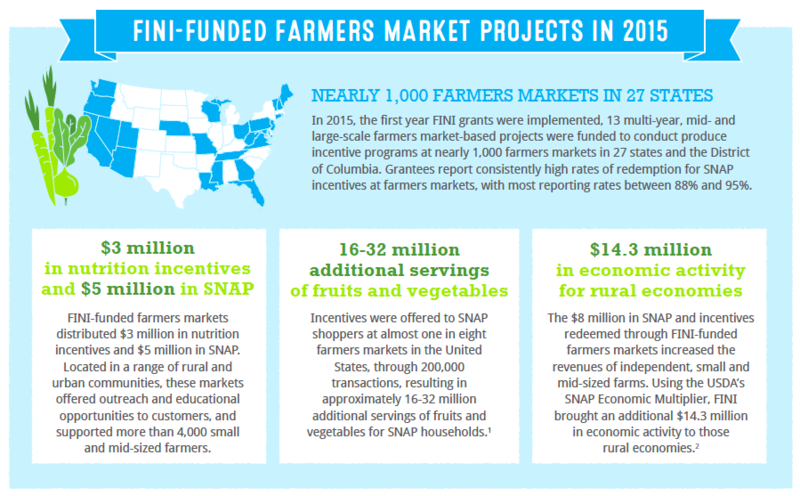 In 2015, FINI funded farmers markets distributed $3 million in nutrition incentives and $5 million in SNAP benefits at farmers markets in both rural and urban communities. These benefits funded the purchase of tens of millions of additional servings of fruits and vegetables. Early research indicates that participants are consuming greater quantities of a wider range of vegetables and fruit and in so doing improving their diets. FINI’s impact was remarkable given the infrastructure and logistics required to offer farmers market SNAP incentives on a national level. In 2015 incentives were offered to SNAP shoppers at almost one in eight farmers markets in the United States. These markets successfully processed 200,000 SNAP transactions. Learn more about the outcomes of the first year of FINI funded programs at farmers market in FMC’s report: Year One of the USDA FINI Program: Incentivizing the Purchase of Fruits and Vegetables Among SNAP Customers at the Farmers Market. Special thanks to all 2015 grantees that provided data for the report, and to Wholesome Wave for funding this initiative. Increase the purchase of fruits and vegetables among SNAP participants by providing incentives at the point-of-sale. Develop efforts and develop safe and efficient benefit redemption technologies for farmers markets and direct marketing farmers. Eligibility: Nonprofit and government agencies, including individual farmers’ markets, state associations, and affiliated nonprofits are eligible to apply for the grants. For-profit food retailers may participate in incentive programs but may not be the lead organization that receives the federal grant. Match: Every proposal requires a $1:$1 match. This can be provided through state government, local government, or private sources; cash and/or in-kind contributions, including facilities, equipment, or services. The non-federal share of the funding may come from. Federal money cannot be used to match. Include benefit redemption technologies that can be replicated elsewhere. SNAP incentive programs draw more SNAP participants to shop at markets, increase participants’ fruit and vegetable consumption, and enhance local economies.